A most remarkable election which has resulted in zero Muslim MPs from Uttar Pradesh and only 20 nation-wide (out of 543). Mamata Banerjee is the super-caste leader of a party with the maximum number of muslim MPs and is now the face of secular India (not Rahul Gandhi). The sole muslim candidate of the BJP (Syed Shahnawaz Hussain, Bhagalpur) lost to a Hindu from Rashtriya Janata Dal (RJD) - Lalu Yadav's party that survives on a muslim-OBC vote bank!!! In a first-past-the-post system you normally need 35% and above to win. The BJP/NDA alliance secured 38% vote-share nation-wide and scored a massive victory. In the same way in Odisha (Biju Janata Dal), Bengal (All India Trinamul Congress) and Tamil Nadu (All India Dravida Munnetra Kazhagam) the winners swept up 40% and above votes and secured a mammoth mandate. 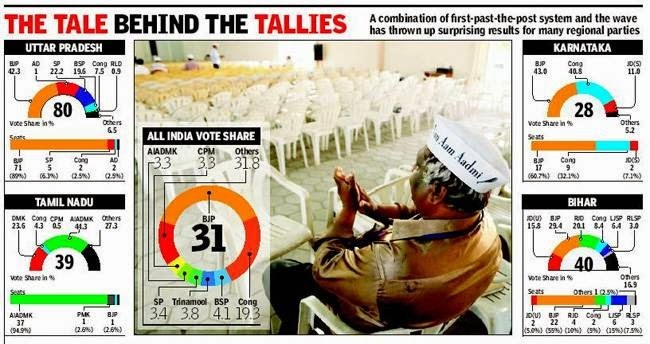 The losers got significant vote-share: BSP (Mayawati) got 20% in UP (zero seats), CPI(M) got 30% in Bengal (2 seats), Aam Admi Party got 33% in Delhi and 25% in Punjab (zero in Delhi but 4 in Punjab!!! ), DMK got 27% in Tamil Nadu (zero). In Odisha Congress got 26% (zero) and BJP got 22% (1 seat). The worst performance came from muslims, the largest minority in the country (20% of the population, considering under-counting in Census and migrants from elsewhere, but multiple majority districts in Bengal, Axom, Kerala, Uttar Pradesh, Bihar, and Maharashtra). The above shows that first-past-the-post systems are flawed and what should be in place is a sophisticated form of proportional representation which will protect the diverse nature of India (more than any number of vote-banks performing tactical voting can every hope to achieve). The 16th Lok Sabha will have one of the lowest numbers of Muslim MPs with just about 20 of them emerging victorious in the Lok Sabha polls which saw a saffron surge in the whole north and western parts of India. Uttar Pradesh, which has 80 seats, has not sent any Muslim candidate in the just concluded election. An analysis of the results shows that there are about 20 winners who are from the Muslim community in the 543-member House while BJP does not have a single MP belonging the community. Going by estimates, there are more than 25 Muslim members in the outgoing Lower House.